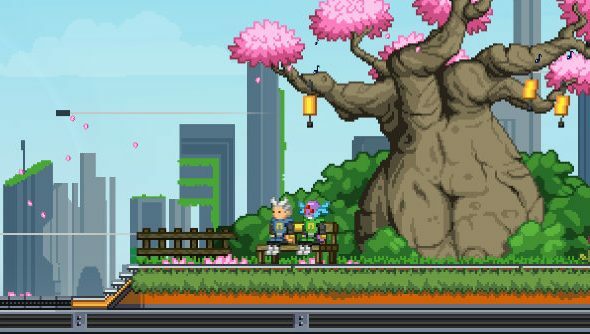 After four years in Early Access, Starbound is finally bound for a full release. The developers are just making some pre-flight checks. Why not check out some other small studio brilliance in our list of PC’s best indie games. Starbound version 1.0 will include new features, the biggest of which being a complete story mode for the space adventure. The story casts you as a Protector in training, tasked with guiding the universe towards peace. It’s an adventure which begins on Earth, before sending you on a quest into the twinkling unknown. This story plays out across eight instanced missions that take you from sunken libraries to ancient temples. These are unlocked by searching for clues across the usual sandbox, and each mission ends with a unique boss fight. When victorious, you’ll get new friends that expand your outpost, which will upgrade as you progress. On top of that, planets will include several different biomes and dungeons, with more interesting things to find in each and more variation between them to keep players surprised. And all this will also be peppered with optional side quests. There are loads of other tweaks too, like how multiplayer is getting streamlined, thanks to Steam, and Steam Workshop integration is also coming. If you want to get into the nitty gritty, check out the full patch notes over on the official Starbound post. There’s no official date as yet, but we will update once there is.